This was the report from 2013. By today it’s got to be closer to a three billion dollars. All of this is an illegal payment to non citizens. Being the child of an illegal alien born on US soil does NOT confer citizenship and this abuse has to be STOPPED. Trump talks about the border wall, but they will climb that wall to GET THE CASH! These costs do not include the 500 million dollars spent to educate illegals in Los Angeles or the 400 million dollars spent each year on prisons. Los Angeles County officials believe that by the end of 2013 illegal immigrant parents will have received $650 million in welfare benefits for their native-born children, according to a CBS Los Angeles report. Los Angeles County Supervisor Michael D. Antonovich has revealed the most recent Department of Public Works figures showing that through July $376 million in CalWORKS benefits and food stamps have been paid out to illegal immigrant parents, the CBS affiliate reports. 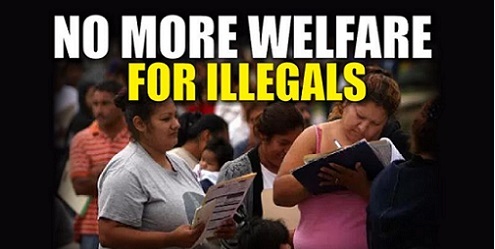 According to the report, about 100,000 children of 60,000 illegal immigrant parents receive about $54 million in welfare payments a month — $20 million in CalWORKs benefits and $34 million in food stamps — up from $53 million in July 2012. “When you add the $550 million for public safety and nearly $500 million for healthcare, the total cost for illegal immigrants to county taxpayers exceeds $1.6 billion dollars a year,” CBS Los Angeles quoted Antonovich.